Shop with Security and Peace of Mind. 25 years since 1993 in business . Authorized Products, Exceptional Service, Unbeatable Prices, & Fast LOCAL Delivery! We sell and Ship Nationwide via 5-7 days Secured, Insured Air Shipment. This product is brand new & includes a full one year manufacturer warranty. 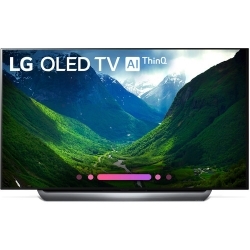 Product Highlights -UHD 3840 x 2160 OLED Panel -HDR10, HLG, Dolby Vision Support -Advanced HDR Support via USB -LG AI ThinQ OS -Built-In Wi-Fi & Ethernet Connectivity -LG Content Store for App Access -Full Web Browser -4 x HDMI / 3 x USB -Google Assistant & Amazon Alexa Support -Dolby Atmos Decoding α9 Intelligent Processor The α9 Intelligent Processor is designed to deliver true-to-life images with rich colors, sharpness, and depth for enhanced realism. 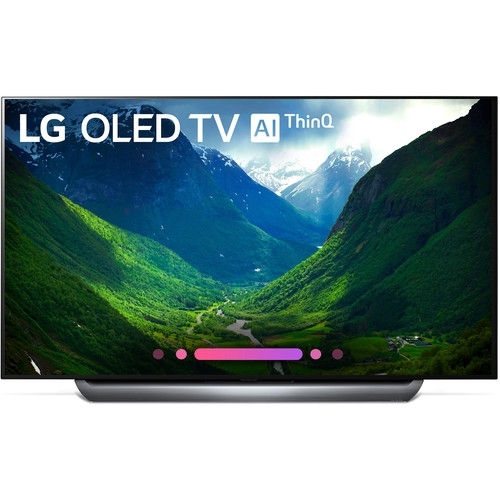 LG AI ThinQ AI ThinQ TVs are engineered to become the hub for all your connected smart devices. Beyond apps and entertainment, LG AI ThinQ uses voice control with Google Home built-in, plus Amazon Echo compatibility to create a smart TV platform for your IoT devices. 4K Cinema HDR The C8PUA series supports the HDR10, HLG, Dolby Vision, and (via USB) Advanced HDR formats. Dolby Atmos Decoding Dolby Atmos surround sound technology dispenses with channel-based coding in favor of more advanced object-based coding, giving the sound designer the ability to precisely place sounds anywhere in the 3-dimensional space. Additional Features Infinite Contrast Pixel-level dimming Ultra Luminance Pro Intense Color 10-bit color for a billion rich colors True Color Accuracy Wide viewing angle 4K Upscaler Google Assistant Google Home & Amazon Alexa compatibility with optional equipment Intelligent Voice Recognition Universal control capability Gallery Mode LG Content Store for app downloads Full web browser Channel Plus Screen Share & Content Share screen mirroring DTS-HD decoding Bluetooth audio playback (version 4.2) LG Sound Sync Integrated 802.11ac Wi-Fi with Wi-Fi Direct IP control Simplink HDMI CEC ARC support via HDMI 2 Display Screen Size (Diagonal) 76.8" Panel Type OLED Aspect Ratio 16:9 Pixel Resolution 3840 x 2160 HDR Compatibility HDR10, Dolby Vision, Hybrid Log Gamma, Advanced HDR Contrast Ratio Not Specified by Manufacturer Dynamic Contrast Ratio Not Specified by Manufacturer Refresh Rate Not Specified by Manufacturer Viewing Angle (H x V) Not Specified by Manufacturer Video Video System ATSC, Clear QAM TV Tuner Yes 3D No Connectivity Primary Connectivity Location Display Input Ports 3 x HDMI – Audio, Video (Side) 1 x HDMI – Audio, Video (Rear) 1 x RF Antenna – Audio, Video (Rear) 1 x RCA Composite – Video (Rear) 1 x RCA Stereo (L/R) – Audio (Rear) Output Ports 1 x TOSLINK Optical – Audio (Rear) USB Ports 2 x USB 2.0 – Audio, Photo, Video (Side) 1 x USB 2.0 – Audio, Photo, Video (Rear) Ethernet LAN Control RS-232C Speaker Sound Stereo Subwoofer None Power 40 W Orientation Not Specified by Manufacturer Dolby Digital Yes Convenience Virtual Assistant Support Amazon Alexa, Google Assistant Operating System AI ThinQ Wi-Fi Built-in Picture in Picture (PIP) Not Specified by Manufacturer Picture Modes Not Specified by Manufacturer Sound Modes Not Specified by Manufacturer Media Player Not Specified by Manufacturer Digital Media Slot Not Specified by Manufacturer Menu Languages Not Specified by Manufacturer Remote Control Yes Tilt/Swivel Not Specified by Manufacturer Wall Mounting 400 x 200 mm Remote Microphone Yes Battery Type Not Specified by Manufacturer Dimensions (WxHxD) Not Specified by Manufacturer Weight Not Specified by Manufacturer General Power Requirements 120 VAC, 50/60 Hz Power Consumption Standby: < 0.5 W Energy Star Compliant Not Specified by Manufacturer Dimensions (W x H x D) 67.8 x 39.0 x 2.2" / 172.2 x 99.1 x 5.6 cm Without stand 67.8 x 41.4 x 10.0" / 172.2 x 105.2 x 25.4 cm With stand Weight 65.9 lb / 29.9 kg Without stand 80.5 lb / 36.5 kg With stand Packaging Info Package Weight 109.0 lb Box Dimensions (LxWxH) 73.5 x 44.5 x 11.0" ONE YEAR WARRANTY FROM LG.